Home / International Football / Americas / US Soccer President completes stellar line up for Soccerex USA! US Soccer Federation (USSF) President Carlos Cordeiro will be part of a stellar line up at Soccerex USA on November 15/16 in Miami that includes the senior leaders from each of North America’s most important soccer leagues and federations. President Cordeiro will address delegates as part of the opening ceremony, immediately before the Confederation of North, Central America and Caribbean Football Associations (Concacaf) President Victor Montagliani gives an exclusive interview on his One Concacaf vision and the responsibilities of the confederation in the modern football environment. Other Concacaf speakers include General Secretary Philippe Moggio and Manolo Zubiria who will be analysing the success factors of Concacaf Competitions. Director of Development, Jason Roberts will share his thoughts on grassroots soccer across the Americas and Head of Women’s Football; Karina LeBlanc will join National Women’s Soccer League (NWSL) Managing Director, Amanda Duffy to discuss what Women’s soccer needs to do to realise its huge commercial potential. Major League Soccer (MLS) Commissioner Don Garber will speak alongside Mexican Football Federation (FMF) President in a special session dedicated to the unique relationship between soccer in Mexico and the US; from the new Campeones Cup to the importance of the US market to the Mexican national team and the exciting potential impact of the 2026 FIFA World Cup. MLS and its commercial arm Soccer United Marketing will also be demonstrating the league’s willingness to embrace data and technology with senior Directors Gary Stevenson, Amanda Vandervort and James Ruth discussing innovation, fan experience and eSports respectively. From a wider league perspective, United Soccer League (USL) President Jake Edwards will be discussing the international influence on the success of domestic soccer in the US and what his counterparts in leagues around the world from his experiences. Also, Canada Soccer Association (CSA)’s Chief Strategy and Development Officer, Earl Cochrane will be sharing insights on creation of the new Canadian Premier League (CFU) in a panel that will also include Caribbean Football Union President, Randy Harris. In addition to these senior figures from CFU, Concacaf, CSA, NWSL, MLS, USL and USSF, Soccerex USA will also showcase the expertise of both domestic and international clubs with the likes of FC Cincinnati, Inter Miami CF, Orlando City SC and Minnesota United joining experts from AFC Ajax, FC Barcelona, FC Bayern Munich, Club America, Paris Saint-Germain and Manchester United on the programme. LaLiga President, Javier Tebas will also give a presentation on the leagues continuing commercial growth. 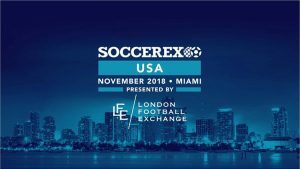 Soccerex USA is sponsored by the London Football Exchange, the world’s first fully integrated soccer club stock exchange and marketplace, and hosted in partnership with GACP Sports. The two day event will take place at Miami’s iconic Marlins Park and will comprise an exhibition showcasing the latest soccer business, performance and technology innovations. Soccerex USA will include a programme of structured and informal networking events to connect delegates from across the USA and the rest of the world and it will feature a market leading conference agenda, with international experts tackling topics such as league expansion, women’s soccer, youth development, stadia technology, investment and new commercial opportunities. For more information on Soccerex USA please go to www.soccerex.com/usa . Previous VIDEO – Bengaluru FC: BFC Grassroots Festival! Next High flying FC Goa shocked by Jamshedpur FC in 1-4 defeat!